This is the other side of the city the less seen and less known, but not forgotten! The invisible Barcelona experience will take you on a bike ride through the eyes of Mamadou, a social entrepreneur from Senegal living in Barcelona. He'll tell you the story, show you the streets of the Raval neighborhood so that you have a deeper understanding of why it's such a special place in the city. You'll see a different side of Barcelona, a controversial neighborhood: the Raval. You'll support the young workers of the Raval, through a variety of services that this experience includes. The mechanics on board are youth at risk of exclusion who are given an opportunity to find their passion through their work. You'll support the work of a local social entrepreneur who also has an NGO in Africa that has innovative educational projects. The money collected from this experience is destined to support the education of the guides and the work that goes on behind this project. • Frequency: Every Thursday, Friday & Saturday. Also available other days with appointment. • This experience includes the bike, a bottle of water and insurance for your bike. We always have a mechanic on call in case of an emergency. This experience will take you through enchanted places of El Raval, neighbourhood where you will gather hope and inspiration. 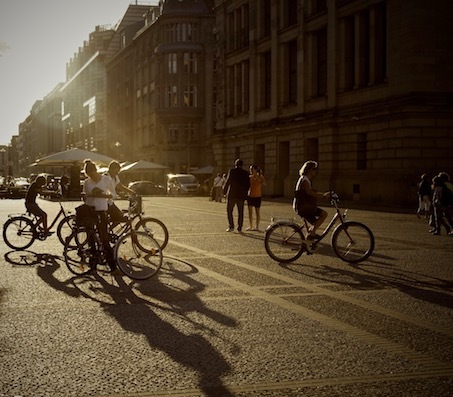 This is an easy and safe biking journey that will also allow you to explore the bike culture in Barcelona. Your guide is a social entrepreneur from Senegal who was once a customer of many social entities in the Raval, he has now become a volunteer for them. He gives talks about his journey and his work at schools and universities and is passionate about sharing the unknown social network and the problems the Raval neighbourhood has gone through. This is why he has designed this experience a unique bike ride where you’ll get to meet some of the social organizations that are making a difference. Many of the guides we work with have been reintegrated into society through these entities and they share their stories to inspire and connect with visitors. Every guide that works in this experience is trained in a way so that they can excel at their work through their unique set of skills so that they can be integrated into the workforce. You’ll end this experience with a leisurely walk on the beach to relax and share your thoughts. Mamadou is a really inspiring! His tour is original an insightful, it feels good to be part of such a cool project helping with integration of young guides and also it's neat to visit the the Raval neighbourhood this way, really cool thank you!